The Asus ROG Strix Scar 2 with the Nvidia GeForce RTX 2060 is the same as its non-RTX counterpart in every way, save for the GPU. Even with this small change, it offers noticeable improvements in GPU-centric tasks like gaming, photo editing and video editing. You still get a great keyboard which works for typing long documents as well as it does for gaming. The display is great for all round use and the narrow bezels make it more immersive. The only real downside to the machine (besides the fact that it could be more powerful) is that its heavy and not exactly a "portable" laptop. 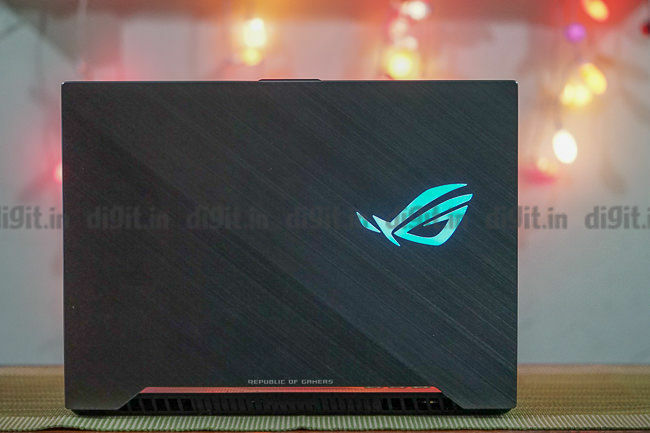 It was only a few months ago that Asus launched the ROG Strix Scar II in India, powered by an Intel Core i7-8750H processor and Nvidia GTX 1060/GTX1070 GPUs. Then at CES, the world was introduced to RTX GPUs for laptops and once again, the GPU game changed. Asus was quick to update its portfolio of gaming machines and we now have the RTX version of the Strix Scar 2, the company’s FPS-centric gaming laptop. Asus tells us that they will not discontinue the 10-series powered machine for now, allowing gamers to have a choice across various price points. Let’s find out just how much of an improvement the RTX variant of the Scar 2 has to offer over the non-RTX one. The ASUS ROG STRIX SCAR II GL504GV is powered by the Intel Core i7-8750H and an NVIDIA RTX 2060 6GB SKU. There is also a more expensive variant with the RTX 2070, which isn't the Max-Q variant for anyone wondering. The review unit we received had the below specs . The Asus ROG Strix Scar 2 carries forward the same design as its non-RTX counterpart, maintaining consistency in the product line. We love the RGB light strip that sits on the front of the laptop, just below where the lid closes, and the ROG logo on the lid, which glows. The laptop weighs a notable 2.4 kilograms, making it not very easy to lug around the machine. The laptop has a total thickness of over an inch and hence, does not fit in most camera bags as I sadly learned on a recent international trip where the laptop accompanied me. The construction of the laptop is pretty solid, but the lid has a bit of flex, not just on the top, but also on the hinge. Being as thin as the display is, it is easy for it to flex if you lift it or close it from one edge. The hinge on which the display rests is itself very sturdy and holds the display in place without any slack. The point here is, the Asus ROG Strix Scar 2 is built well, with the tradeoff being a slightly thick body and the 2.4 kilos of heft. 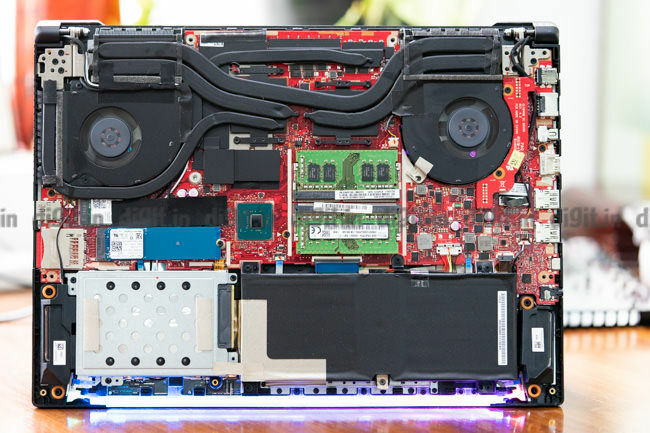 One of the joys of owning a gaming laptop is knowing that when the time comes, you can take the bottom off and upgrade some of the internal components in order to boost performance. Companies have taken different approaches to make this process easier (or harder in some cases) and with Scar 2, the process is somewhere in the middle. Easiest upgrades are when all you have to do is take off a small panel off the bottom by unscrewing one of two screws. With this machine, however, the entire bottom has to come off. Once the insides are revealed, you are greeted with a red motherboard, and we can't help but wonder if this is some kind of a design choice, given ROG’s original brand colours being red and black. The 16GB of RAM is courtesy 2 8GB sticks clocked at 2666MHz. This is a big relief as the non-RTX version of the Scar 2 that we had reviewed earlier came with a single 16GB Stick. There’s also the 256GB NVMe drive that operates at PCIe x2 speeds, along with a 1TB Seagate FireCuda SSHD. The SSHD is mounted in a caddy, which is supported by a little bit of foam padding to prevent any mishaps because of sudden movement. For cooling, we see a generous amount of copper heat pipes going across the new RTX 2060 and the Intel Core i7-8750H accompanied by two 12V fans, which come with a unique design that helps separate the dust from the air. In terms of upgrade and repairs, users should be able to easily replace the RAM, SSD, HDD and even the Wi-Fi card if needed. The speakers are also easily replaceable in terms of how they’re packed into the machine, but whether you’ll be able to find replacements easily is another issue altogether. 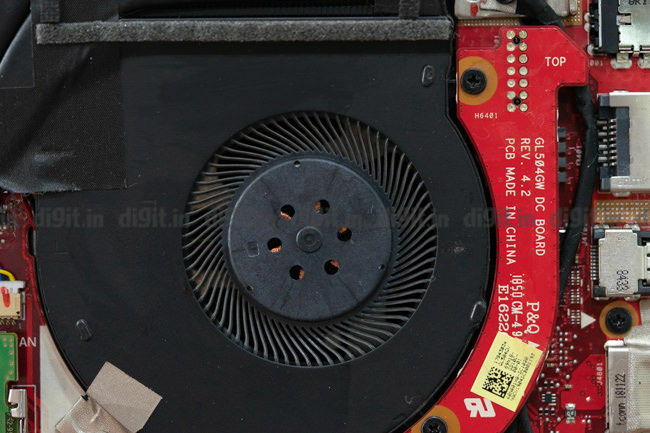 The dual fans should also be easily replaceable if needed, provided you can find spares for them as well. One of my favourite things about the Asus ROG Strix Scar 2 is the keyboard, which also comes with a compact num-pad on the side. The keyboard itself offers RGB backlighting with 4 zones and a host of effects available in the Aura console. The keys themselves offer a 1.8mm of travel and curvature of 0.25mm. The curvature is barely noticeable to the eye, but when your fingers strike the keys, you feel it mate perfectly with your fingers. The WASD keys are transparent on the Scar 2, giving it a dedicated fps-gamer feel. 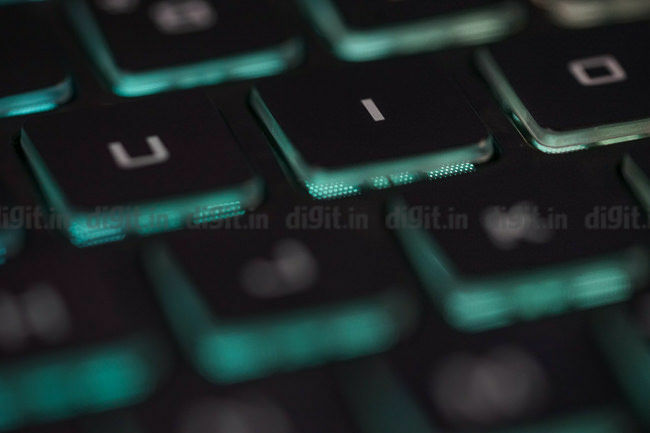 While the keyboard itself is great for gaming, it also serves as a great tool for typing, with its soft key presses and low actuation point. The dedicated volume keys, a key to mute the microphone and one to bring up the Asus Armory Crate software are definitely a great thing to have. The trackpad on the Asus ROG Strix Scar 2 uses Windows’ precision drivers and has two distinct left and right click keys. The advantage of this kind of click setup is that they can both be used together while gaming, in the rare case that you find yourself without an external mouse. By itself, the trackpad offers excellent response for most use cases, but naturally, is not recommended for competitive gaming. The Asus ROG Strix Scar 2 also offers a very generous selection of ports, ideal for a lot of different kinds of users. In terms of USB, there are a total of 3 USB 3.1 Gen 1 ports, two on the left and one on the right. There is also a USB Type-C port that operates at 5Gbps. Along with an HDMI 2.0 port, the Scar 2 also hosts a Mini Displayport 1.2 connector which is capable of driving monitors with a resolution of 4K @ 60Hz. Lowering the resolution on the external display allows for frame rates as high as 144Hz (at 1080p). On the right side, you will find the trusty old SD Card slot as well. The Asus ROG Strix Scar 2 sports a Full HD panel capable of 144Hz refresh rate and a response time of 3ms. The Nvidia GeForce RTX 2060 on board this machine isn’t powerful enough to push most games to this frame rate at high graphics settings. However, if you tone down the graphics on some games, you can find yourself enjoying higher frame rates. We’ll discuss this in the performance section for specifics. the display also sports extremely narrow bezels, something we love. The IPS display is said to offer 100 percent sRGB colour reproduction, but we were only able to achieve 98 percent coverage as revealed by our Spyder colour calibration tool. What was a little surprising, however, was discovering some very strong light bleed on the corners of the display when there’s a pitch black image on the screen. The light bleed, thankfully, does not have any presence when there is content playing on the screen, whether its games, watching movies or even so much as browsing the web. 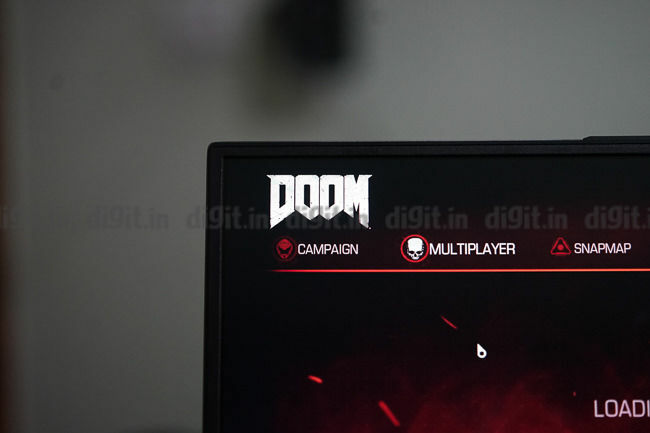 The IPS panel is a great addition and a lot of gaming laptops are starting to use this. This stems from companies finally realizing that creative professionals are just as likely to pick up gaming laptops as gamers. Since creativity tools require equal, if not more power than even the most demanding of games, the only thing that was missing was a colour-accurate display. With an IPS panel on board, photographers, indie-filmmakers and even colouring artists have at their disposal the perfect tool for their job. The Asus ROG Strix Scar 2 has a fairly standard configuration for gaming laptops, that is, an 8th generation Intel Core i7-8750H mated with 16GB of RAM. The differentiator here is the Nvidia GeForce RTX 2060, which is supposed to offer some interesting performance enhancements. We are going to measure the performance of the machine across three parameters; synthetic benchmarks, gaming performance and photo & video render tests. 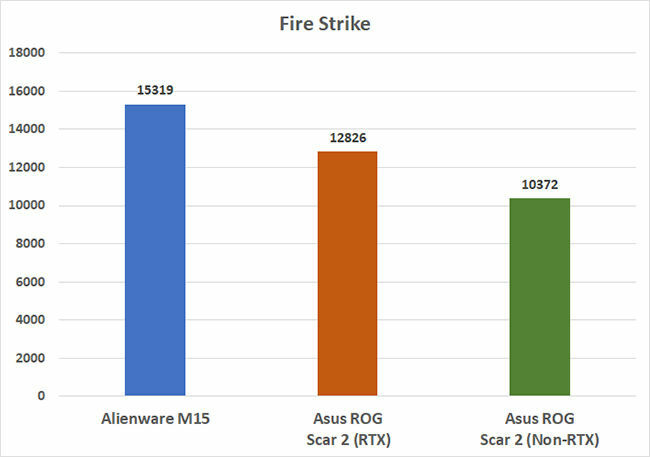 Given that the new Strix 2 comes with the same hardware as that on the non-RTX variant, we didn’t expect a huge variance in numbers. 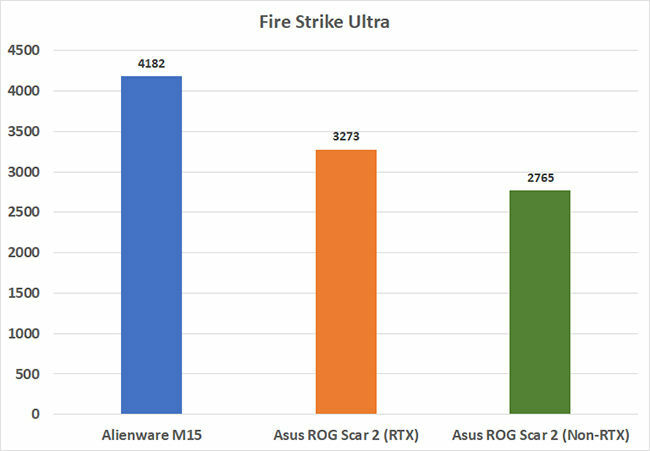 Surprisingly, some of the benchmark numbers were notably higher on the RTX version of the Strix 2 than its 10-series counterpart. 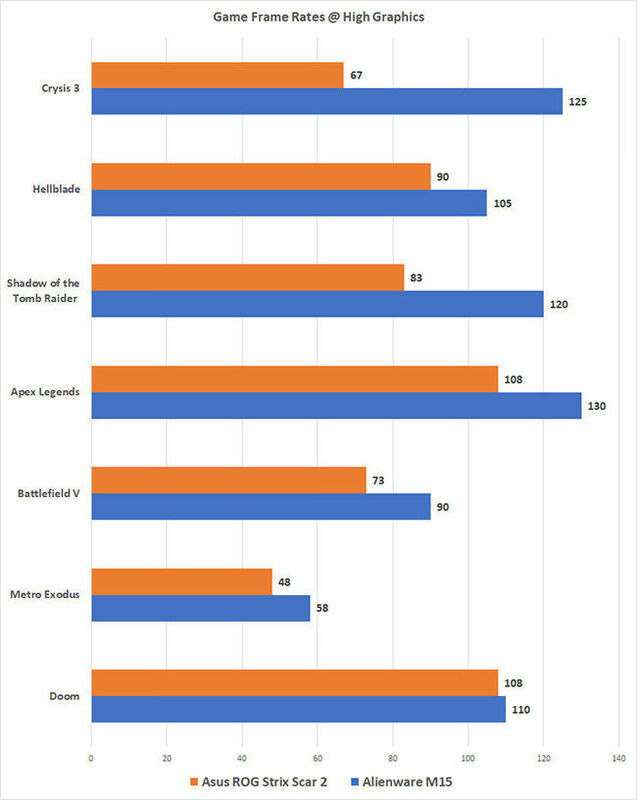 Below is a comparative graph for 3DMark’s various benchmarks showing the performance delta between not just the two Strix 2 variants, but also the Alienware M15 which we reviewed a few weeks ago. There’s an interesting realization to be had here. Keeping the processor and RAM the same, the change in the GPU does show a notable difference in numbers, even in synthetic benchmarks. The RTX 2070-powered Alienware outperforms the 2060-powered Strix 2, which scores higher numbers across the board in comparison to the GTX 1060 powered Strix 2. When it comes to gaming, the Asus ROG Strix Scar 2 offers a choice of performance. Bear with me as I walk you guys through what I mean. With the new RTX GPUs, Nvidia has opened up doors for a whole new kind visual fidelity. While this is great for desktops, where if your GPU isn’t pushing enough frames, you can always just upgrade it, as long as you got the money, it's not great for a laptop. With a laptop, you’re basically in a committed relationship with the CPU-GPU combo the minute you pull the trigger on any laptop. 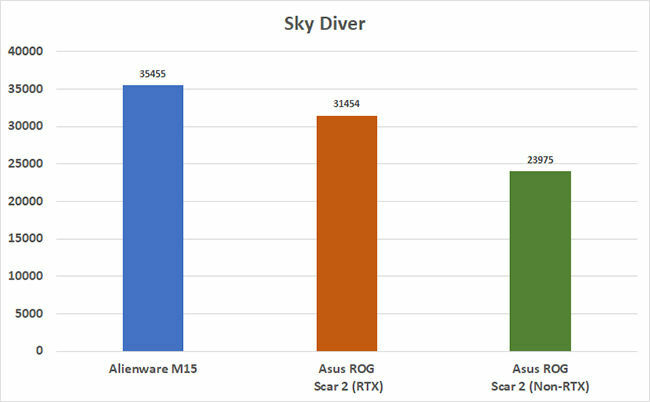 With an RTX-powered laptop, you can choose between higher frame rates or visual fidelity, as you will see in the numbers below. We tested the laptop with a number of popular, modern day gaming titles at their highest and 1-less-than-highest graphical settings. For the sake of consistency and clarity, we refer to them as Ultra and High graphical settings in our charts. We measured the numbers with RTX turned off, and for games that support the feature, we tested with both RTX and DLSS turned on as well. With the games set to their most demanding setting, we noted that Metro: Exodus was just about playable at an average frame rate of 41fps. This is definitely in line with how we expected the game to respond, given its brutal demands on any gaming system. Moving to more favourable titles like Battlefield V, we averaged a very playable 60fps. What we did notice, however, were occasional frame-drops, not necessarily isolated to instances of heavy on-screen action. 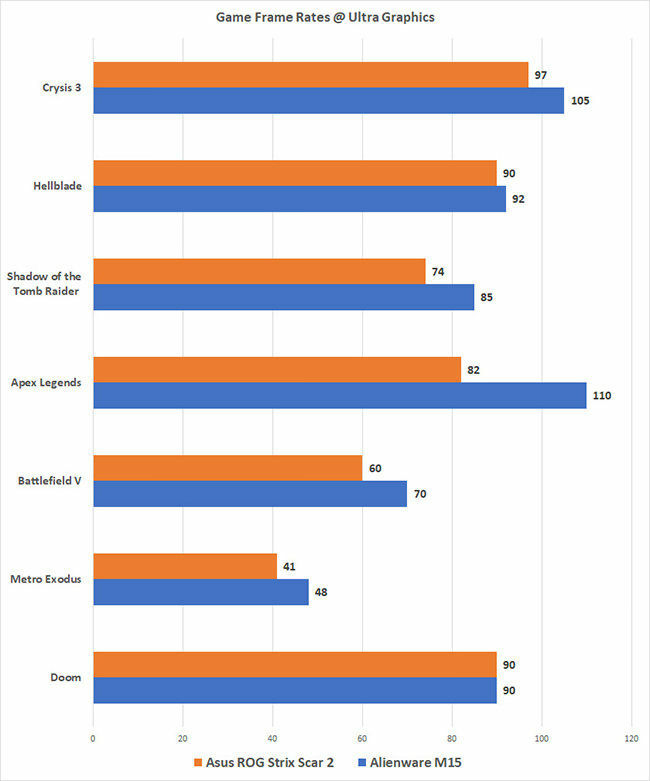 Titles like Doom, Shadow of the Tomb Raider, Apex Legends and even Crysis 3 managed to maintain pretty impressive frame rates as well. You can see all of the average frame rates in the chart below. Bumping things down to one-lower-than-highest, we saw varied improvements in frame rates. In some cases, the jump was barely noticeable (Metro: Exodus), but in some cases like, Doom and Apex Legends, we saw the numbers breach the century mark. This leads us to believe that the Nvidia GeForce RTX 2060 could push some games to the 144Hz mark, provided you’re willing to trade off the visuals. Now coming to the big feature of the new Scar 2, the RTX capabilities of the GPU. We tested the laptop on Battlefield V and Shadow of the Tomb Raider, RTX and DLSS turned on. Do note that RTX for different games is currently enabled only for specific visual aspects. For Battlefield V, it's enabled for reflections, for Metro: Exodus, its Global Illumination (lighting & shadows) and for Shadow of the Tomb Raider, its only for shadows. 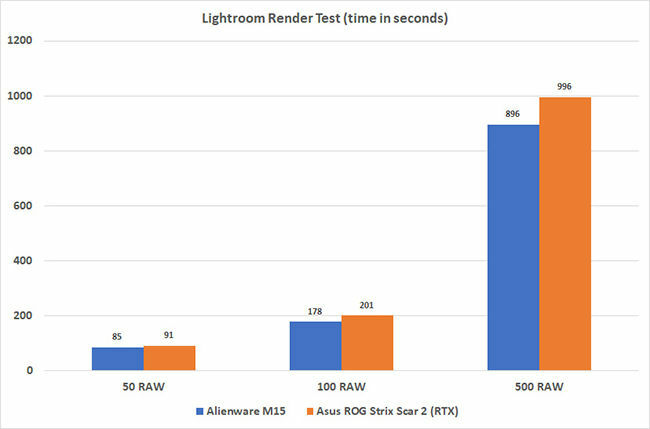 Whatever may be the case, turning RTX on will significantly impact frame rate delivery, which is why Nvidia also created Deep Learning Super Sampling or DLSS to compensate. 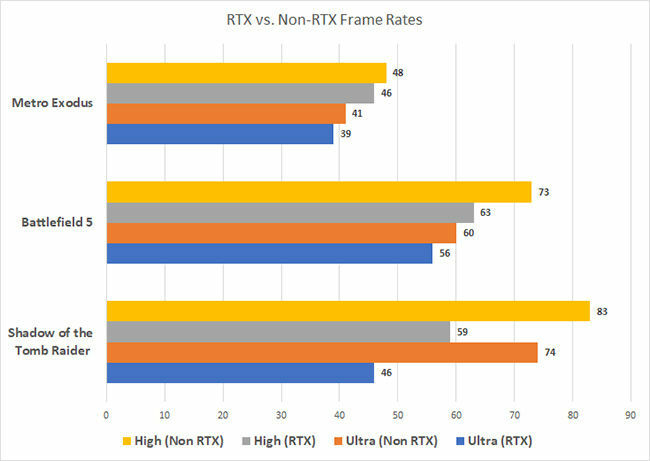 Below are our findings, compared to the non-RTX frame rates. 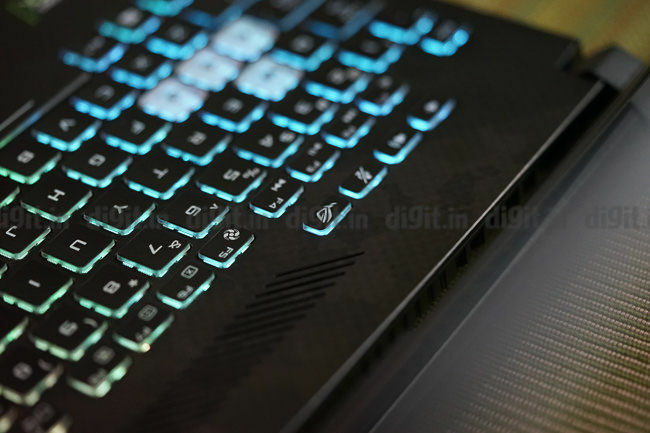 As I had mentioned earlier, the gaming laptop manufacturers are fast realizing that the creative industry is just as lucrative a target audience for them as gamers. We run our render test in three batches, one by rendering 50 images, second by rendering 100 images and third by rendering 500 images. All images in question were shot on a Nikon D800 with a resolution of 36 megapixels and are in RAW format. We compare the render times of the Scar 2 with those of the Alienware M15, which comes powered by an Nvidia GeForce RTX 2070, the impact of which shows in the render times. For video editing, we used Adobe Premiere Pro and found that the laptop was easily able to handle 4K and 1080p edits. Using native 4K and 1080p timelines and no proxies, we found that playback of 4K footage was a little choppy in the preview window, especially once you apply LUT profiles. With the preview quality at 50 percent, things are smooth. You could, however, really speed up your workflow by using proxies. What is a given with gaming laptop with any kind of decent hardware is heat. Asus has been making a big deal about their cooling tech for a few years now and on the Scar 2, we can somewhat see why. While gaming, the WASD keys remain incredibly cool, thanks to the fact that there is a 12V fan just under the keys, pulling in cold air. The laptop exhausts hot air from the back and the right side. While we did not experience any kind of heat-related throttling, we did experience significant discomfort while gaming. The exhaust vent on the right side of the laptop made using an external mouse quite uncomfortable. Playing any game past 5 minutes results in an exhaust temperature of about 61 degrees, and all of that heat will hit your right hand as you move the mouse around. The only way to not be impacted by this is to have your mouse placed atleast 6-7 inches away from the right side, something that many users may find unnatural. The Asus ROG Strix Scar 2 sports a decent sized battery, essentially a 66Whr slab of lithium. On PCMark 8's creative test, we clocked a run-time of 3 hours and 48 minutes, which isn't a lot but is decent for a gaming laptop. Of course, if you were to game on the Scar 2 while it was not plugged in, expect the battery life to drop fast, along with the performance. This is due to the fact that when the machine is on battery power, it switches over to Intel graphics. However, if you want to just do basic day-to-day things like watching some videos or working on documents and presentations, the performance should be fine, although, keep an eye on the battery indicator anyway. The Asus ROG Strix Scar 2 RTX edition is pretty much the same laptop in terms of its build and design that we reviewed earlier, but there is one major difference: the GPU. 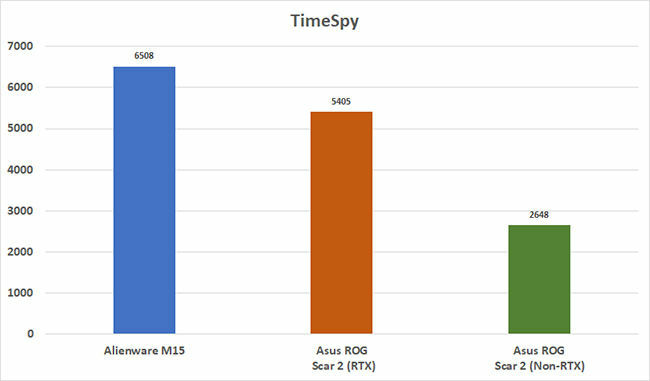 We see that the RTX 2060 powered Scar 2 outperforms the non-RTX version of the laptop across every benchmark by anywhere between 15 and 30 percent. Even when gaming, if you want the joys of real-time ray tracing, you can always just turn it on in supported games and get playable frame rates, or you could turn it off and enjoy even higher fps. In some games, you could even get 100+ fps, depending on the graphics settings. What Asus has done with the Scar 2 series is provided options for users across a wider price range and the RTX 2060 variant falls very much in line with the performance we expected from it.